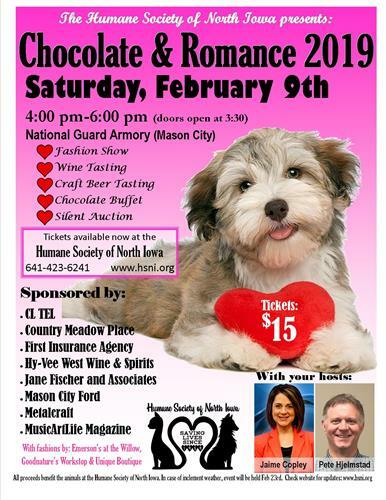 The Humane Society of North Iowa presents:Chocolate and Romance 2019! This fundraiser event includes: a fashion show (featuring human AND canine fashions), wine-tasting, craft beer tasting, silent auction and a delicious chocolate buffet. This event is being held at the National Guard Armory (1160 19th Street SW, Mason City). And back by popular demand....Pete Hjelmstad! Meet adoptable shelter animals on site! Tickets are $15 and are available for purchase at the Humane Society of North Iowa during open hours (Tues-Fri (10-5), Wed (10-7) and Sat (10-4)). A limited number of tickets will be available the day of the event.